This entry kind of goes as a companion to my post on Monday about Trader Joe's Organic 100% Natural Fruit Wraps. We'll be doing some comparing and contrasting since they're such similar products, sold in the same little section of TJ's. The biggest difference between these two types of dried fruit bars is that these Fiberful ones are indeed full o' fiber, as the name so blatantly and appropriately declares. Six grams in one bar. That's not too shabby for such a thin, flat piece of snack food. And I'll be brutally honest, you can immediately detect the presence of fiber in the bars when you start chewing—there's definitely a gritty, almost dirt-like texture to these babies. Their fruit flavor wasn't bad. It was actually pretty similar to that of the other fruit wraps. But the problem was I simply couldn't enjoy the flavor while chomping through layers of sawdust and cardboard. Here again, I find myself playing the bad guy. I know from just the small amount of online research I did that these bars are fairly well-loved by the general populace. And if you bought these fiber-rich snacks for the purpose of getting some extra roughage in your diet and you consider the incredible amount of fiber they've crammed into them, their texture is acceptable. And at this point, I would leap dutifully into a paragraph or two of potty jokes and bathroom humor, if not for the fact that I've learned my lesson the hard way that fart jokes do not generally go over well in mixed company. Furthermore, a food blog is the last place on earth we'd want to hear such filthy musings. So, for once, I shall listen to my better judgment and conclude this post here. Sonia wasn't terribly impressed with these bars either. A 3 out of 5 from her. I just can't give these a great score when I know there's a much better alternative right on the same shelf at TJ's. A 2.5 from me. 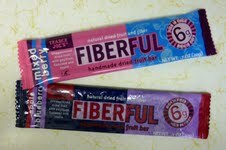 I like the Fiberful bars a lot, but if they are available, it is more cost effective to buy the bag of Fiberful ends and pieces. They are the trimmings from the bars but taste exactly the same. Yes, when I was on Weight Watchers I discovered these and was waaay into them because with so much fiber they had a very low "points" count. I definitely prefer the apricot flavor, but didn't ever detect the objectionable texture you refer to. I think they're good! I did have that "sawdust" experience with some other high-fiber items, though, like tortillas (non-TJ's). Ick. And I just found out last night that these are discontinued!! So bummed!! They discontinued the fiberful bars. Anyone know where we can get them now?